Handcrafted Cultured Pearl Stud Earrings, "Nascent Flower"
Luminous white pearls evoke swelling floral buds, nascent flowers about to burst into bloom. 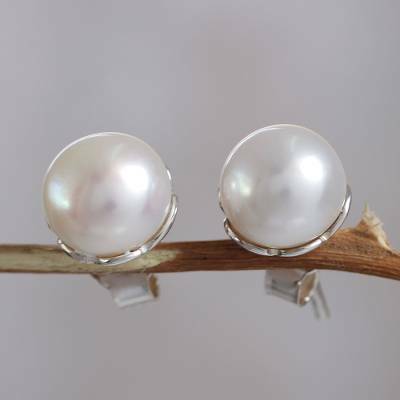 Working in sterling silver, Marianela Vargas crafts classic pearl stud earrings with a subtle floral theme. You can find cultured pearl stud earrings 'Nascent Flower' by Marianela Vargas in jewelry categories such as Birthstone Earrings, Pearl Earrings, PEARL Cultured Earrings, Silver Earrings, Sterling Silver Earrings and Stud Earrings. Enjoy exploring these sections for other Novica treasures. I ordered another pair of the "Nascent Flower" earrings because they are just what I wanted. I am a senior citizen. "Nascent Flower" earrings do not weigh down my ear lobes and are attractive yet subtle. I might order another pair of earrings just in case one earring gets lost. I would like to rate these earrings a 5 because the design is beautiful, but they broke after one month. The earrings were a gift for my daughter. They arrived promptly and were even lovelier than pictured. The earrings quickly became my daughter's favorite. However, the pearl fell off after one month. We were very disappointed.